All creatures feel pain, fear, love and hope. All creatures deserve to live a life free of suffering. However the reality is that many animals suffer terribly at the hands of people. Your mission is to stop the suffering of at least one animal and give it hope for its future. This might be as simple as changing what you choose to eat, starting a petition or supporting a cause. Or you might want to start up your own local action group to protect animals! Get in touch and we'll show you how! If you have a great project which you need funding, visit our Fund your Mission page in the menu. How you can help! If you eat meat, eat only the meat from animals which are free range farmed or which are sustainably caught from the oceans. Don't eat meat from endangered species such as tuna, or shark fin products. Don't eat anything which contains unsustainable palm oil. Don't buy eggs that are factory farmed - check they are free range and don't buy any fur products you don't know the source of - these may be from animals which have been seriously ill-treated. Stop Factory Farming NZ - find out about factory farming in NZ. Is the same issue happening in your country? Send us an email telling us more! 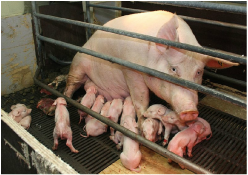 End factory farming - find out how you can help! Choose kindness over cruelty.